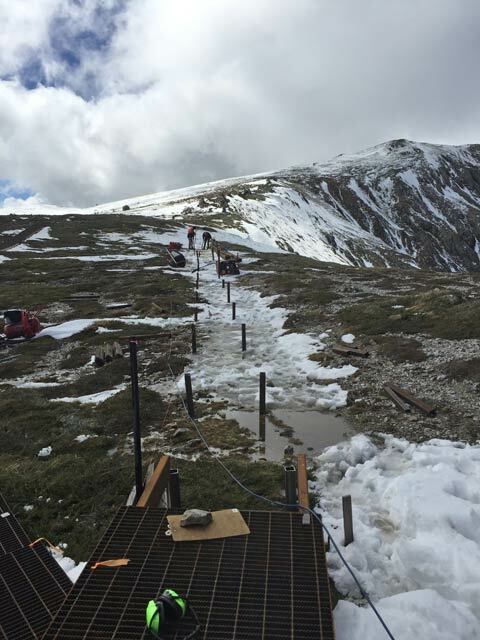 At 8.30 on Monday 1 April we started out from Charlotte Pass. Going bare feet across the Snowy River and Club Lake Creek was a solid early wake up call. Soon after, Dale had to withdraw due to having a heavy cold. 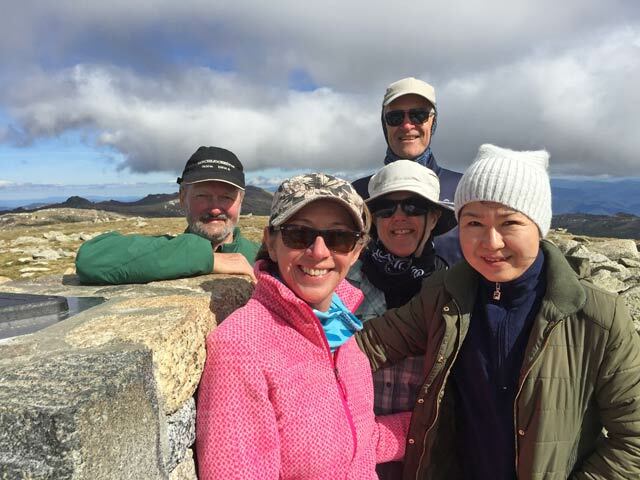 The remaining 5 of us ascended to Blue Lake Lookout and then to the turnoff to Mt Twynam. A good deal of snow had fallen on Saturday and Sunday, so it was an amazing vista. After dropping our packs in favour of super light packs we trudged off to Australia’s 3rd highest mountain. It was slow going in the snowy conditions. 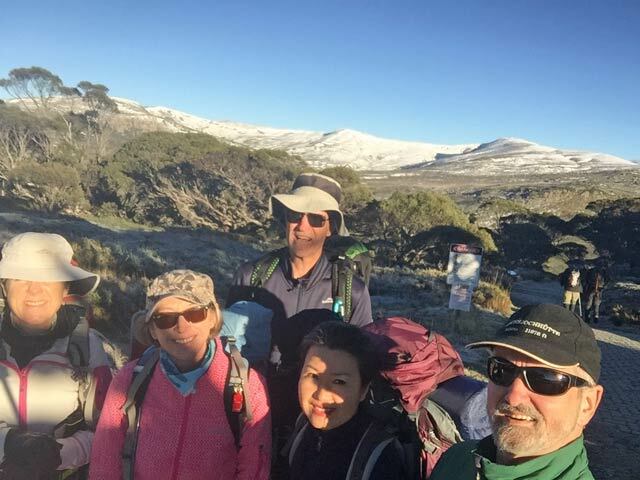 Upon return to our packs (5.8kms), we headed off towards Carruthers Peak and Northcote Pass. There was much less snow in this area. We found a good camping spot above Wilkinsons Creek and beneath Muellers Peak. 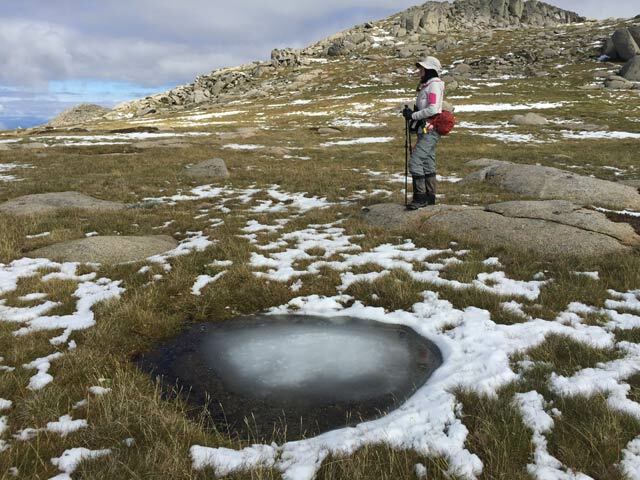 Townsend, Abbott Peak, Byatts Camp, and Mount Kosciuszko. 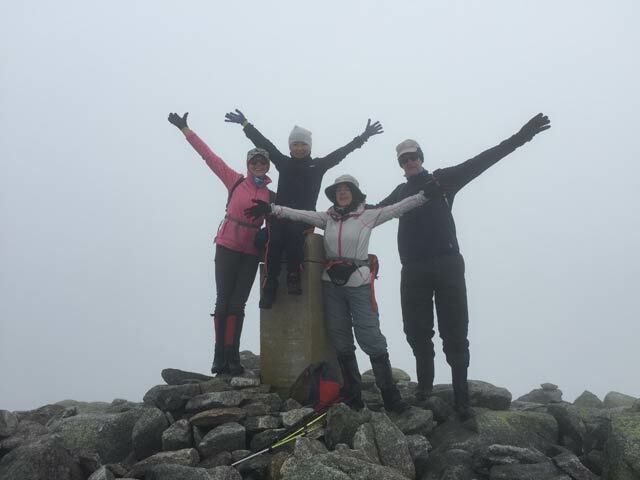 After that Roy & Warwick opted out of Mount Etheridge, while Nicola, Ena and Marcia (on her 60th birthday) went for the summit. It was getting late by this point and we knew the wind was going to get up during the night so we decided not to camp below Rams Head North. So where were we going to camp? Roy decided there was an inviting set of rocks off the boardwalk above the Snowy River. We thought we’d be ok there but how do you combat NNW winds at 65 mph gusting to 85 kph? The short answer is you don’t. You just hope your tent is up to the job. We woke (most after little sleep) to a windy and very misty morning. Roy decided to forget doing Rams Head and Ram Heads North because of the very strong winds and a white out on the top. 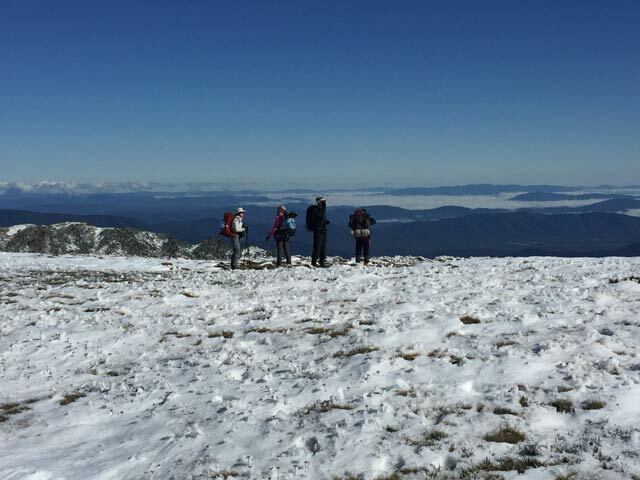 Instead, it was off to Kosciuszko Lookout and then heading east below the ridge line and picking up the old poled ski route. Rather than cross the Snowy River, we followed it around and reached the road at the Merrits Creek Bridge. We then got to below Kangaroo Ridge, where Ena and Marcia had had enough and headed for the car. Roy, Nicola & Warwick then trudged uphill through annoying low heath to the high point of the Ridge (2078m). From there it was across undulating ground to Mount Stillwell where we had lunch before the wonderful downhill jaunt to the cars. 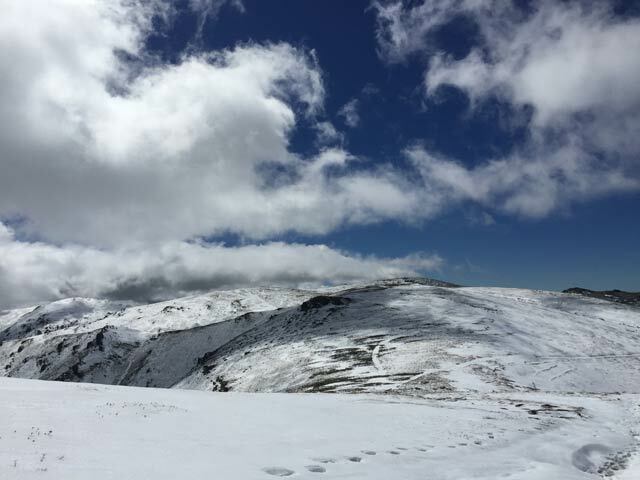 We might not have got the Top 10 Summits, but we did get the top 3 and on day 1 experienced a winter wonderland.